AD111 is een standaard compacte pH en ORP- meter met automatische pH calibratie, HOLD functie, low battery indicatie, temperature meting en compensatie. De AD111 kan ook ORP/ Redox in mV meten indien u een orp-sensor aansluit (optioneel) . Standaard wordt een pH epoxy electrode, rvs temperatur sensor, batterijen en instruction manual meegeleverd. Auto-off na 8 minuten geen gebruik. 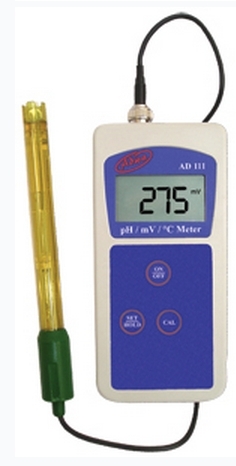 AD111 is a compact pH meter featuring automatic pH calibration, HOLD function, low battery indication, temperature measurement and compensation. In addition, AD111 can measure in the mV range, if using a redox-electrode. Supplied complete with a pH epoxy body electrode, stainless steel temperature probe, batteries and instruction manual. Auto-off after 8 minutes of non-use conserves energy and lengthens battery lifespan.